Are we apes through western eyes? 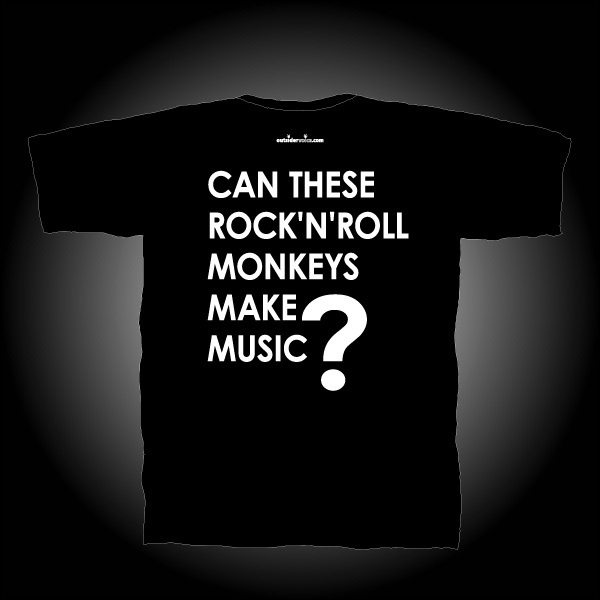 Can these rock 'n' roll monkeys make music? Despite the many problems with global impact affiliated with the West, many people of all races look upon Western culture and Western values as superior to others. I think that much of this is based on feelings of Caucasian racial superiority. Around the age of puberty I had an inferiority complex about my appearance in comparison to Caucasians. Their facial features, the shape of their bodies, the color of their skin, etc. all seemed to represent an ideal beauty that I could never have. I don't think that this is an uncommon feeling among non-Caucasians. As I became more mature, these feelings about physical appearance became less powerful, but I still felt a sense of inferiority in regard to Western culture, lifestyle, affluence, and status in the world. In this sense the West still represents an unreachable ideal. All of which leads me to question how Western people see Asians, and Japanese in particular. I think that they look down on us, whether consciously or unconsciously. I feel this very strongly whenever Bush stresses U.S. superiority in his speeches. But we also think that we fall short of Western standards and as a result are always trying to catch up. Can you give your honest of how Japanese are regarded through Western eyes? Are Japanese looked down on, or are we just too self-conscious about how we are perceived by the West? I'd like to use rock music as an example. Here in Japan, all music is divided into two categories: Japanese music and Western music. They say that rock 'n' roll was invented by white musicians who were influenced by black blues music. White people absorbed the music of those they had oppressed and the rock music that resulted achieved great popularity all over the world as representative of Western culture. We are trying to catch up to their level of rock music, although most of us doubt that we will ever succeed. Do Westerners, especially Americans, have the opportunity to know Japanese rock music? Do they think Japanese rock music is worth listening to, and can they enjoy it as well as Western rock music? Many Japanese musicians or idols play and record with American musicians and engineers, do those musicians have respect for their Japanese colleagues? I am sorry that I am rambling so much in this letter. Please feel free to give your honest opinions about these matters.